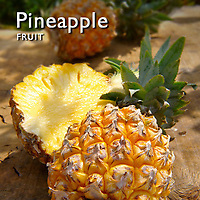 Fresh pineapple fruit food picturesphotos & images. 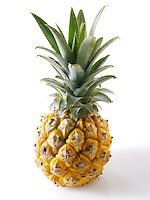 Pineapple (Ananas comosus) is the common name for a tropical plant and its edible fruit which are coalesced berries. Pineapples are the only bromeliad fruit in widespread cultivation. It can be grown as an ornamental, especially from the leafy tops. Some sources say that the plant will flower after about 24 months & produce a fruit during the following six months while others indicate a 20-month timetable. Pineapple is eaten fresh or canned or juiced. It is popularly used in desserts, salads, as a complement to meat dishes and in fruit cocktail. 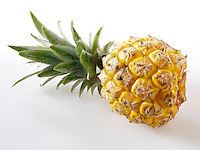 The popularity of the pineapple is due to its sweet-sour taste containing 15% sugar and malic and citric fruit acids. It is also high in vitamin B1, B2, B6 and C. Its protein-digesting enzyme bromelain seems to help digestion at the end of a high protein meal.